Hours are 10:00 a.m. to 5:00 p.m., Monday through Friday. Evening, weekend and holiday hours vary according to event schedules. The box office accepts cash, Visa, MasterCard, American Express and Discover cards. It is our policy that you cannot line up before 7:00am. A lottery makes lining up early unnecessary. Using a lottery system helps to prevent scalping, and ensures everyone the chance to be first to purchase tickets. Only one raffle will be issued per person. If a person takes multiple tickets they will be disqualified. Patrons must be 12 years old to participate. Anyone that arrives after the lottery must go to the end of the line. 9:00am – Raffle tickets are distributed. Everyone that arrived before the drawing will be issued a raffle ticket. At 9:30am we will draw one ticket at random. The person with the matching ticket number becomes the first person in line. Everyone else will line up in numerical order behind this person. If your number is lower than the drawn number you will go to the end of the line. If you arrive after 9:30am and miss the drawing then you will go to the back of the line behind everyone that participated in the lottery. There are 100 people who are in line that receive a raffle ticket. We pick the number 50 at random. The person with number 50 will lead the line and 51-100 will line up behind the person. Those with raffle numbers 1-49 will stay in numerical order, but go behind the back of the line behind number 100. Please be aware that participating in the lottery does not guarantee you a ticket to the event. It only guarantees you a place in line. With the rise in the number of “secondary ticket agencies / scalpers”, we have experienced an increase in the number of invalid tickets being presented at our entrance gates. BOK Center is not able to honor, replace or refund any invalid tickets. Customers with invalid tickets are welcome to purchase valid tickets at BOK Center Ticket Office – seating location and price based upon availability. 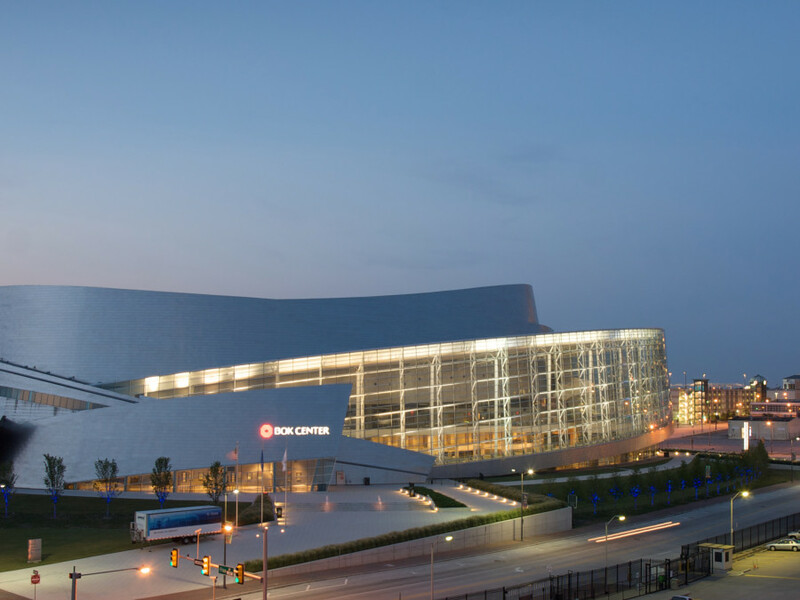 BOK Center is located in the heart of downtown Tulsa. 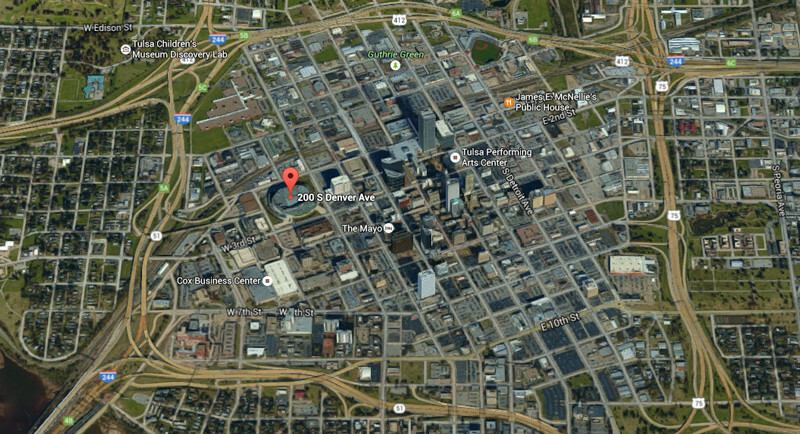 The mapping and directions are to the nearest intersection of the BOK Center, which is 3rd Street and Denver Avenue. Parking opportunities are available at private parking facilities located throughout Downtown. BOK Center does not own or operate any parking areas. There are over 9,000 available parking spots within a ten-minute walk of the arena. All privately-owned lots determine the rate for parking, and City of Tulsa requires an $8 per car charge for public parking. After 5pm all on-street metered parking is free. Please use the information below to help plan your visit to downtown Tulsa. If tickets to an event are not on sale yet, how can “StubHub.com”, “Ticketsnow.com”, etc., already have tickets for sale at inflated prices? BOK Center does not provide tickets to these companies. These sites are “speculating” that the sections they have listed will be available for them to sell. Re-sellers don’t buy tickets themselves. They provide an online marketplace for ticket brokers or individuals looking to sell and consumers looking to buy. What and where is will call? When purchasing tickets by phone or online, you may choose to pick them up at the Arby’s Box Office Will Call window. Please be prepared to present the credit card used to purchase the tickets, as well as a photo I.D. Press and VIP tickets, or tickets left by a third party, may also be picked up at Will Call prior to the event. A photo I.D. is required. Tickets to an event went on sale at 10:00am. I was online at 10:01 and the best available tickets were in the upper level, but 5 hours later I was able to get floor tickets. How does that happen? Can I exchange these for floor tickets? Unfortunately, you cannot exchange tickets. When buying tickets, you must remember that everyone has access to the same tickets and these are available through every outlet, over the phone, and online. Sometimes a buyer does not complete the purchase transaction, and their seats are released back for others to buy. I bought tickets to an event at your building, but I need a handicap accessible seat. Can I exchange my seat? Can my wife and son sit with me? You cannot exchange your ticket in advance. When you arrive at the venue you may go to the Arby’s Box Office and request to be relocated to ADA seating. Standard policy is one handicap seat plus three guests. This opportunity depends on availability of the seats. Accessible seats are available on each level of the BOK Center. What age does my child have to be to require a ticket? Most events do not require a ticket for children under the age of two. However, in order for a child to have his/her own seat, a ticket is required. Some shows intended for young children (i.e., Sesame Street Live) require children over the age of one to have a ticket. To inquire about specific events, please call (918) 894-4200. Visit www.bokcenter.com or www.ticketmaster.com. You may also call 918-894-4200. I am planning to bring a large group to a BOK Center event. Can I get a group discount on tickets? Most events do not require a ticket for children under the age of two. However, in order for a child to have his/her own seat, a ticket is required. Some shows intended for young children (i.e.,Sesame Street Live) require children over the age of one to have a ticket. To inquire about specific events, please call (918) 894-4200. The show was cancelled, now what? In the event of a cancellation, tickets may be returned to your point of purchase for a refund. If tickets were ordered by phone or online, a refund will be applied to the credit card used to purchase the tickets. My tickets were lost or stolen. What do I do? Any lost or stolen ticket can be reprinted at the Arby’s Box Office. The person who ordered the tickets along with the proper credit card and photo I.D will be required. I can no longer go to the event. Can I get a refund? Tickets purchased are non-refundable and cannot be exchanged. Can I resell my tickets? The resale of event tickets on the grounds of BOK Center is strictly prohibited. To avoid problems with counterfeit or stolen tickets, or inflated prices, please purchase your tickets through authorized Ticketmaster outlets only. The Arby’s Box Office accepts cash, Visa, MasterCard, Discover and American Express credit cards. No checks accepted. To purchase tickets online or by phone you must use a Visa, MasterCard, Discover or American Express credit card. Where is your handicap parking? Patrons with disabilities may be dropped off on 2nd Street between Denver Avenue and Frisco Avenue and enter through the Main Entrance. BOK Center does not have any onsite parking. However, to view a map of the parking near BOK Center, click here. Where are ADA, Limo and Taxi drop-off and pick-up locations? All patrons may be dropped off on 2nd Street between Denver Avenue and Frisco Avenue and enter the Main Entrance. How can I reserve ROCK & BUS shuttle? Rock & Bus is working with the BOK Center to provide shuttles from cities around the venue. Luxury charter buses will bring you to the show right when the doors open so you can make the most of the concert. Enjoy the show and your bus will be waiting for you after the last encore. Reserve today and lock in your spot! Visit http://bokcenter.rockandbus.com to make your reservation today. Can I bring food or drinks into the arena? Outside food or beverages of any kind (alcoholic beverages included) may not be brought into BOK Center. What time do doors open for each event? For most events, doors open 90 minutes prior to start time. This may vary by event. For specific information, please call the BOK Center at 918-894-4200 or check the event specific page on www.bokcenter.com. Are cameras allowed for BOK Center events? For most events, at the request of the artists and/or leagues, cameras (specifically cameras with professional/detachable lenses and flash) are not permitted. BOK Center reserves the right to examine and prohibit the use of any camera that conflicts with the policy set by the event. Audio recorders, video recorders and digital cameras with video capabilities are prohibited during all events. The specific camera policy for an event can be found on the event page for that show. Your sound system is too loud, or not loud enough. Can you tell your audio people to fix it? BOK Center does not control the sound system for events. The show provides their own equipment and handles the sound level. Where is the Lost and Found located at BOK Center? During an event, you may inquire about lost or found items at any Guest Relations location. For inquiries following an event, please call 918.894.4200 during normal business hours. What security is in place to ensure my family’s safety? BOK Center staffs both private security and off-duty Tulsa police officers to provide security before, during and after events. Depending on the current Homeland Security National Threat Advisory, BOK Center will base event security upon that level along with the performers security rider. Can I smoke at BOK Center? In accordance with Tulsa City ordinances, smoking is prohibited in all public areas at BOK Center including the arena and concourses. A smoking area has been provided outside, east of the box office and across from section 119. Numerous merchandise or novelty booths are available throughout BOK Center during events. May I re-enter BOK Center once I have left? For your safety, once a person exits BOK Center, re-entry is strictly prohibited. Are there any items that are prohibited at BOK Center? Any other item deemed unacceptable by event/building management. Is tailgating or overnight parking allowed? What kind of alcohol is served at BOK Center? Beer and liquor are available for purchase by patrons 21 years of age and older. The number of alcoholic beverages served may be limited to one drink per person, per purchase. Management reserves the right to refuse service to guests who appear intoxicated or who are disturbing other guests. Beer sales are discontinued approximately forty-five (45) minutes before the end of the event. Can I buy backstage passes? Backstage passes may not be purchased and are not available through the BOK Center. Can I bring in banners and signs? Banners and signs are permitted as long as they do not block the view of others, interfere with the event, contain advertising of any form, present a safety hazard or contain political or obscene material. Banners may not be affixed with any type of material that is permanent in nature or that alters the facility in any manner. Poles and sticks are prohibited. Building management reserves the right to remove any banner or sign. Signs may also be prohibited if requested by the event. Can I host a business meeting or special event at BOK Center? Corporate/private gatherings are available for 10 to 20,000 patrons. Catering and event planning services are also available. Please call 918.894.4200 for more information. I am involved with a non-profit and need to request a donation. How do I do that? Please allow at least three (3) weeks for processing. Submission of request does not guarantee a donation will be offered. Do you have any fundraising opportunities? Fundraising opportunities are available now at BOK Center. SAVOR…Tulsa provides a unique fundraising opportunity for non-profit organizations. For more information, please call (918) 894-4300.